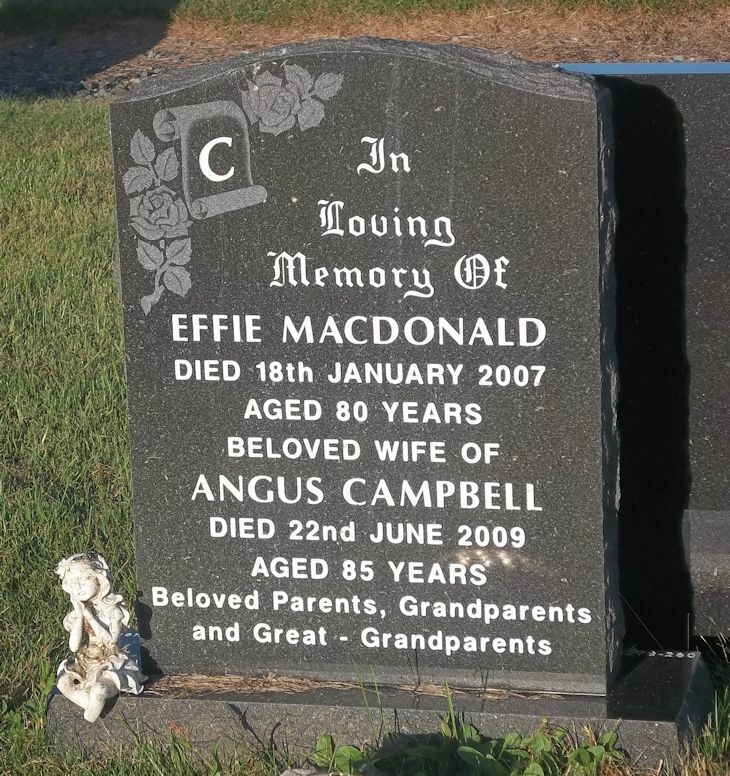 Skye Gravestones | Effie (Macdonald) & Angus Campbell. Effie (Macdonald) & Angus Campbell. In/loving/memory of/EFFIE MACDONALD/died 18th January 2007/aged 80 years/beloved wife of/ANGUS CAMPBELL/died 22nd June 2009/aged 85 years/beloved parents, grandparents/and great-grandparents. Picture Added on 29 August 2018. Hello, I am a Spaniard and it has caught my eye the name of EFFIE because I have a sister with that name, here in Spain it is an extremely rare name, it has the long form of EFIGENIA, in our case the name comes from our grandmother. It would interesting to know a bit about Effie MacDonald. Added by Reyes Romero on 08 October 2018. Effie is used as a short version of Euphemia, which was a name used in earlier times but less now. Added by Roddie Macpherson on 10 October 2018.